This post started as a lengthy email to a friend who is currently on an expedition to the Arctic Circle, and asked for some notes on utopia. We have certain political differences, perhaps; more, though, I think the nature of the expedition itself is worth reflecting on, and gave me an opportunity to write out some of the thoughts about utopia that are currently preoccupying me, and which form the basis of a much larger, much longer project. It remains substantially as I sent it, with a few minor alterations. You asked me to write to you about utopia, and this is the third time I’ve drafted this email, having twice ended up with something very bloated and useless. As you know, I wrote a long thesis on some of this, much of it dense to the point of impenetrability and quite often wrong. Nonetheless, an academic thesis is rather like an embarrassingly elaborate but useless toy: you get it out on social occasions to manically reaffirm its worth. Of course, utopia is an obsession for me as well, which makes it doubly hard to write about: it’s hard not to scope into wide digression, or even to know what’s really useful or telling. It’s also hard to worm one’s way out of the conventional narrative about utopias, the great cliché being that the twentieth century is in some sense the history of the failure of utopian schemas for society. That’s as true as it is untrue, but, most of all, a reductive and boring way to think about things; more interesting might be to ask what political imagination does, and is for, and why its narrowing is seen as an inevitability. Anyway, this email is in three parts, the first about the historical phase of utopian writing in the west, the second about theorising utopia (not that the two are ever really distinct), the third about some specific political questions about this expedition you’re engaged in, about which I have some serious reservations. Though I don’t want to carry out some kind of intellectual apologia, parts of this might be rigorously theoretical or abstract, but my conviction is that utopia sets out many important questions and thinking through it with some discipline is necessary. I’ve tried to evacuate it of as much density as possible. Firstly, it’s important that we look at the history of written utopias, because they implicitly set the tone for much modern thinking about possible or ideal states. It’s notoriously hard to define historical boundaries for utopian writing, because the boundaries become either too restrictive or so general as to include any kind of thinking about how to organise a state. For me, there’s particular phase of English utopianism that flourishes from More’s Utopia through Bacon to Margaret Cavendish’s Blazing World. Certainly there’s a perceptible change after that, but the 18th to 20th centuries also include any number of politically and literarily significant utopias, just as the period before More certainly includes utopianism avant la lettre. But early modern utopianism is certainly significant. 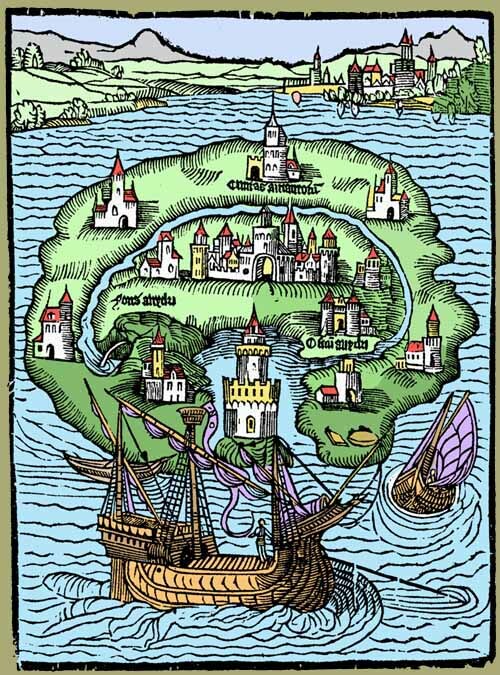 More’s Utopia (1516) and Bacon’s New Atlantis (1627) are the two most prominent (& to me most interesting) texts of the period, and I’ll go into a little about why, though by no means really doing more than scratching the surface. There is little in between them that merits much attention in England, save the wide and influential circulation and misreading of More’s book; after Bacon there’s much more. The chimerical quality of utopian writing is a bit of an intractable problem for anyone who wants to write about utopias: they cross genres, while also being in some sense a genre themselves; you can certainly see in them strains of travel writing, didactic moral writing, satire, manifestos, learned humanist games etc. Perhaps there are better ways at discerning linking features between utopias: one might be the irony of presentation, or the sprung tension between political suggestion and fictional experiment, or indeed the trope of the fantastic voyage and (usually) idiot traveller on strange shores. That latter matters: this writing flourishes right after the discovery of the New World, and in a period of rapidly changing scientific and philosophical orthodoxy, as well as new forms of economy (More and Bacon both being different examples of the new civility), political unrest and protracted war. More’s Utopia tends to be discussed largely in terms of whether or not he *meant* it, and what that would mean: i.e., whether it’s a learned and ironised sigh about the impossibility of a better or perfectly ordered society, whether its careful ironies are a politically astute gambit to smuggle in outrageous ideas, or whether they’re profound misgivings about its practical possibility. The editors of the Cambridge text call it (and I’m inclined to agree) ‘in fact a rather melancholy book’, and an overly optimistic or naive reading of it misses that important factor. 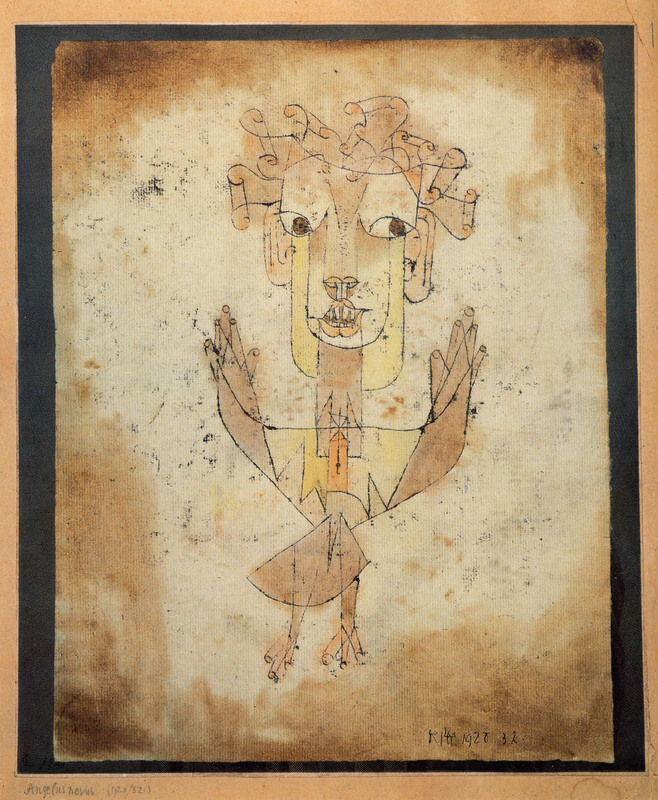 I don’t want to address the book’s extensive engagement with humanist virtues, or its positioning within a network of European humanist thought, or its publication afterlife and circulation, though these things are important; perhaps more important for us is that the book as it comes to us is divided in two parts. The second part is Hythlodaeus’ (a name that means ‘nonsense peddler’) account of his time in utopia, but the lengthy first part is a debate over whether it’s worth entering into politics and the contemporary political problem of theft. These do not seem, initially, particularly useful or apposite conversations to have one’s characters engage in before relating the story of utopia; they’re deadly serious but also by turns dull, prosaic, cynical and unsinspiring. However, the first part was written some time after the utopian narration in the second, after More’s return to England in October 1515. This is not to suggest that the experience of returning to England caused More to realise the impossibility of the utopian project, thus compelling him to readdress and highlight its ironies and incompatibilities with the world as it actually exists, as those practical truths would not have been lost on him at any time – but perhaps that the book is itself caught between political imagination and a sense of the world as somewhat bleak and even in decline. It has been the habit of many to read in More’s (and to a certain extent Bacon’s) text either a nascent communism or the first leaden, nightmare steps of the bureaucratic state. There are historical reasons for this: More and Bacon both witnessing great shifts in economy and property with particular intimacy. What’s not clear with More is the extent to which they’re offered as solutions or predictions; what I think we *can* justly say, thinking about the tensions between the first and second sections of the book is that More’s utopia is offered as a contemporary intervention, indeed as a *reproof* to the clear political problems of his period via systematic imagination. Such may seem obvious, but what I think is particularly interesting about More’s utopia is that it seeks partly to redress issues of imbalance not by focusing on the moral standing of the individual but by thinking systematically about things that seem to be already-established givens within his own political culture. This will become important later. On to Bacon’s New Atlantis, and note the span of a century or so between those two works. It is really Bacon who revives the utopia from More’s skeletal clutch, and rather repurposes it, jettisoning much of its humanist apparatus; it is also intimately connected with the programmes for scientific, philosophical and social reform that Bacon lays out in Instauratio Magna, Advancement of Learning etc. It reads more conventionally like a story to us, with what will become the familiar tropes of utopian adventure: foreign journey, distant shores, buffoonish traveller, perplexing customs, marvellously superior and harmonious society. Rawley, the text’s first editor, makes it plain he sees it as a fable advocating reform of society to establish a similar college of science and learning as the House of Salomana in the text, and it certainly seems obvious that at least some of its political intent is much more immediate than More’s. But that’s by no means a whole account of the story. Bacon’s text, by contrast, reveals More’s as turning on an anthropological rather than technological axis, and seeks to turn the question of utopia away from the nature of the subject’s relationship to general economy and instead toward institutional organisation, scientific power and the relationship between knowledge and the state. Any serious study of Bacon’s text concludes that the real engine of Bacon’s perfect society is not the political structure, which for the most part reduplicates in perfectly virtuous form the political structure of contemporary monarchies, but the ‘House of Salomana’, the great scientific institution, which through ingenious application of science develops technology that allows the Bensalemites to perfectly exploit the immense natural resources of the earth; this is true to the point that economic exchange by money is no longer present in Baconian society. I’d like to go on about the telling economic moments in each text, but don’t really have the space – there’s a particularly fascinating moment in New Atlantis where the newly arrived sailors are simply amazed that no one gets bribed, and try to pay their way into the new society; this is a moment of special poignancy for a Baconian utopia, given the bribery scandal that engulfed him in public office, and the open system of lack and indebtedness that constituted the state economy at the time. The perfect exploitation of natural resources, the unseen monarch existing for the ‘propagation of his subjects’, the perfect munificence transcending imperfect barter and acquisition – all these allow the Bensalemites to trade not in gold, but for ‘light’, that is, knowledge. There’s a lot here that I’m not going to explore fully, about the ways in which this presages the growing importance of instrumentalising scientific discovery for state purposes, or reducing labour, or indeed about the way in which the House of Salomana supplants the formal government of the state as its real animating force, but to my mind this relationship is the crux of Bacon’s utopia, and its most startling political intervention. I’d also point out that this is as much a melancholy text as More’s, coming as it does at a point where the scientific desiderata of Bacon’s reforming programme look unrealisable, at least in part because of the imperfect economic and political system in England at the time. Among the questions posed by the fictional premises of Bacon’s text are, among a number of ‘what ifs’ (e.g., what if lack weren’t the constitutive factor of our economics? ), also the question of what and whom the state is for, what it is designed to achieve, and what it *could* look like. It is also (as Ernst Bloch argues is the chief function of utopia) a compensatory, consolatory work, though that doesn’t necessitate the conclusion that the intervention of hope is a form of intellectual defeat. I think that’s all I need to say on historical English utopias, but I’m acutely aware there’s lots I haven’t mentioned. The development of utopianism over the course of the following century is interesting, especially in the context of religious/political reform and civil war: the most explicitly politically-realised utopian writer would probably be James Harrington (Oceana), but the proposals that came from the Hartlib circle (Plattes, Macaria) and the proliferation of full-employment or theo-political utopias are hugely important – in a sense closer to the development of utopianism on the continent by Campanella or Andreae. There’s a huge concentration in the latter two in the occult symbolism of the city reflecting the heavens, or emblematic dissemination of knowledge, reflecting a preoccupation about the ways in which the ordering of a city can order and perfect its inhabitants. I think that latter brings out something that allows us to distinguish another generic trait of utopia specifically, as opposed to its sometime literary analogues, such as Eden, or the Land of Cockaygne, or Arcadia, all of which propose a similar irenic, perfected space: crucially, all the others are either prelapsarian or simply magical and otherworldly – that is, their plenitude arrives by virtue that they operate according to other logics than the normal human world. Utopias, by contrast, are not lands where roasted partridges magically fly into one’s mouth, but in which the perfectible element of humanity has been perfected by the use of political and social means already at human disposal. Reordering, revolutionising or scientifically enhancing human culture may be at the furthest limits of human social imagination, but it does not require a total break with the possible, as those others do. That, in a nutshell, is the political-imaginative potential of utopian literature. Before moving on from this overlengthy historical note, there are two final things to address: one is the afterlife of utopianism outside the historical period I specified; the second is the extent to which utopian writing has, or can, influence ‘actual politics’ and whether it was ever intended to. On the latter: I’ll take this up a little more in the next section, but I think this question is partly about what the ‘work of hope’ is, and towards what, exactly, our politics are oriented. As I noted, the lacerating ironies with which the better utopias have been quite consciously laced by their authors make it quite hard to determine their ‘serious’ political intent; they are also works of consolation after political failure, or the closing of the horizons of possibility. Nonetheless, they were also taken up as manifestos, or held to be descriptions of real places; Harrington’s Commonwealth of Oceana was very much a (surprisingly influential) systemic political intervention in Cromwell’s England, very thinly disguised as a fictional utopian adventure, and as a predictive analysis of some of the problems of states after revolutions, eerily prescient. Oceana presents the great literary danger of fully politically-oriented utopias, that they break down into merely paratactical descriptions of modes of social organisation, eliding the literary (hence sympathetic) value of the narrative which works to draw its reader into the act of political imagination; it also raises the questions of *when* we delimit the boundaries for utopian effectiveness. 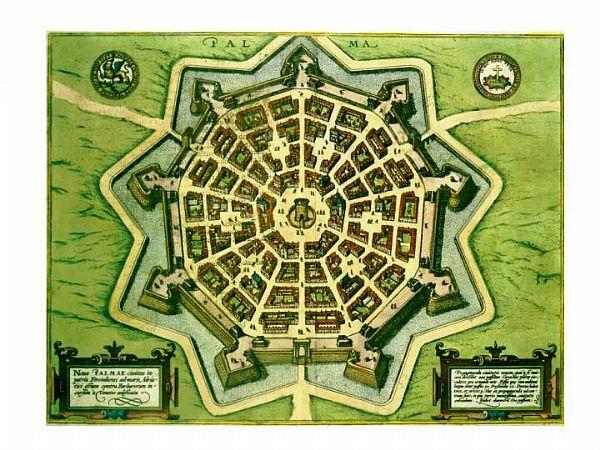 The afterlives of utopias are often more widely influential than their initial reception. I’ve laid out what I see as some of the tensions that have characterised utopian writing in its early modern period, but it’s quite hard to look back at historical utopia after the 20th century and not also see some terrifying tendencies in embryo. There’s also a suspicion that dawns after reading a number of utopias that the people in them are really very thin, indistinguishable, unindividuated, possessing little in the way of passion or exception. (And you pause to think: not for nothing did Plato exclude poets from his ideal Republic.) To a certain extent it’s possible to answer this by saying that strains of utopianism allow the question of distinction between individual political subjects to fade out in favour of asking questions about the *city* as a political entity. Campanella, one of the most prominent continental utopians, asserted that ‘the world is a great animal, and we live within it as worms live within us’ – under that rubric, many utopians are asking questions about the animal rather than the worms. One may certainly quibble with the heuristic by which Carey judges for inclusion within his selection, which is so broad as to be almost meaningless, but it’s certainly the case that fantasies of an ideal society have often sat side-by-side with sickly notions of racial, moral, or social purity; as Carey puts it, they share the desire ‘to a greater or lesser extent, to eliminate real people’. I think this is a substantial problem; it’s also the case that the flourishing of classical utopianism is coeval with the first blossomings of the bureaucratic state, that in many utopias perfectibility is achieved by the full and total functioning of an inhuman bureaucratic system that would give even Foucault nightmares. Carey’s argument, in essence, runs something like this: the utopian propensity necessarily erases the distinction between individuals as human subjects and constrains the freedom to act (especially, to act erroneously), subjugating populations to the control of a centrally planning intellect in service of a particular idea about how humans should live together and flourish. In service of that ideal (which may be as much theological, or racial, or about virtuous production, or efficiency) the state apparatus serves to exclude harmful or threatening elements; the violence with which it does this is visible to a greater or lesser extent, but the establishing force of the state is always violent, and that violence is always held in reserve for deployment at any point in which the order of the state is threatened. What is particularly pernicious about this is that violence against a particular category of people is seen as simply a necessity in establishing and maintaining the virtue and stability of utopian society. Utopia, hence concentration camps. Utopia, hence gulags. As it stands, I can’t find anything much wrong with Carey’s critique, save that it attributes to a particular strand in western political imagination faults that I’d suggest lie far more deeply at the root of political thinking about the state and what it does, or what it’s for: after all, to construct his very broad history of utopia he has broadened the category as to be almost meaningless, and to include pretty much any imaginative exploration of what politics might look like. In fact, most anarchists (or most left-wing critics of the state) would recognise the implicit criticism of structural violence, either more or less submerged, as necessary in the sustenance of the imagined state. What emerges from Carey is an impetus to think about the relationship between violence and sovereignty, the monopoly on ‘just’ violence (a preoccupation of More’s time and ours being the notion of a ‘just’ war), and in what body, precisely, the power of violence is legitimately invested, and how it is extended or distributed among the body of the state. If there is a wider question here, it is to do with what we might call the post-Hobbesian consensus, the degree to which political theory after Hobbes has operated and positioned itself within his social anthropology – but that’s a question that I’ll suspend, because it needs greater, lengthier examination in a far longer project. To my mind, the central issue here is that the imaginative exercise of utopian writing has found itself grasping at the formal limits of its generic category: that is, it proposes and seeks to describe an ideal political entity recognisable to contemporaries, but removing the social ills apparent at its time of writing. Given that the fundamental unit of political thinking has been the sovereign state, our historical utopians have founding themselves thinking with, and through, that category; however, it is also increasingly apparent that the history of the twentieth century highlights the indissoluble problems of state centralisation and violence. Is there a mode of utopia outside of the propositional? Would a solution to centralised power be ‘utopia from below’? Certainly the terrain of utopia has been a fertile one for Marxist thinking over the course of the twentieth century, despite Marx’s nominal opposition to what he called ‘utopian socialism’ (which has less to do with the kind of utopianism we’re discussing here, but may enter on my thinking in the next section.) The standard touchstone for Marxist utopianism is, of course, Ernst Bloch, who is sometimes a tremendously difficult thinker to understand – though I’d argue that this is because Bloch’s attempts to think utopia are attempts to grapple with these very issues, and to rethink it in light of contemporary history as well as a complex of ideas to do with belatedness, hope and redemption. But there are numerous other engagements with the topic, some less obvious than others. The two that I find most important are Adorno and Jameson, and it is no coincidence that they are both critics who are meticulously conscious of the political dimensions of literature or art without making them merely manifestos or diagnoses of a historical condition. Before turning explicitly to those thinkers, it’s also worth looking at Marcuse’s 1967 lecture ‘The End of Utopia’. If we are less likely now to think that we can talk of an end to utopia (by its realisation) as being within our sights, then we might also start to think about what the ‘ends’ (that is, the aims and effects) of utopia might be in our present time. (Marcuse: ‘an opposition is required that is free of all illusion but also of all defeatism…’) This negating mode is the form of utopia important to Jameson and Adorno, and is to my mind the necessary first step in dealing with the problems of the propositional model. I should point out that negative utopia isn’t dystopianism (about which I have said little here, but is interesting in its own right, and for different reasons) nor is it strictly about conceiving a propositional model that escapes the conditions in which it is written, or that collapses under its own totalising force. It’s risky to summarise thinkers like Adorno or Jameson, but an almost adequate one might read: for Adorno, art is negative utopia in its ability to expose the suffering of the present and (importantly) not to offer it a *false* optimism in the possibility of patching up the already-broken present; for Jameson (whose concentration, in Archeologies of the Future, is often on science fiction) the political dimension of utopianism lies in the attempt to break with present conditions, a break which is both bound to fail but also to draw our attention to the limitations of the present, in our inability to imagine a future. That final sentence is crucial to understanding the meaning here, and it also allows us to ask wider questions raised by utopia, the political imagination and the question of the future. It is necessary for us to read Benjamin’s famous image of the angel of history in light of that sentence, I believe – indeed, all of the Theses on the Philosophy of History – but perhaps one of the more telling, on the matter of utopia, is the realisation emerging in the twelfth thesis, that ‘…not man or men but the struggling, oppressed class itself is the depository of historical knowledge.’ The short paragraph is a critique of the pacifying role of social democracy in Germany, asserting that the greatest strength of the working class, and what moves it to revolutionary fervour, is ‘the image of enslaved ancestors rather than that of liberated grandchildren.’ You may or may not believe that assertion, but its point is that the meliorist projection of a slightly improved future operating in the conditions and structures of the present is sold to the working class to preserve those very structures – and maintained by the precarious sense that, if it were to vanish, things could only get worse for your children. The argument for negative utopia is that the totality of its disjuncture from the present refocuses the contingent, limited and unjust nature of existing institutions, without projecting a sticky-sweet sense that everything will be OK; indeed it should place greater pressure on the present. Now, though this is by no means a complete theorising of utopia, I want to move on, but will note a brief desideratum for a theoretical engagement with negative utopia. Obviously, the most prominent question is whether the propositional mode is entirely lost to us, or what might emerge from a serious engagement with negative utopia. 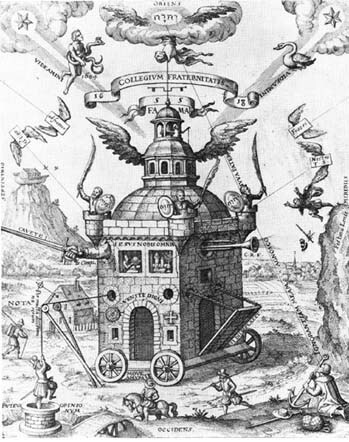 For me, there is an obvious question about the relationships between utopia, history and time which underpins a great deal of Marxist and contemporary critical thought: its germ is in Adorno’s famous passage about the contemplation of all things from the perspective of redemption at the end of Minima Moralia, also Benjamin’s Theses, and found in the various thinkers indebted to them, especially Agamben and, perhaps surprisingly, in Foucault. Some of it might be touched upon in Bloch’s invocation on Brecht to explain utopia: ‘Something is Missing.’ I hate to seem deliberately tantalising, but the ramifications of that passage will have to be left to another, longer piece of writing. The reason I’ve written to you at length is not because I think your current expedition is terribly important, but because the question of the political imagination is at the centre of practical political questions about organising. In its crassest form the dilemma of political imagination is this: ‘oh well, it’s not like you have any solid ideas about anything better!’ or, if one presents any concrete idea, then accusations of hidebound dogmatising and ignorance of changing historical conditions proliferate. Justly so. It’s difficult to escape rattling forth between those two exchanges; we might plot one way of doing so partly by rereading Marx’s Eighteenth Brumaire (‘…here the content goes beyond the phrase’ etc.) but obviously that’s not going to be enough. One of the less historically hardy of Marxist dogmas has been that the immanence of the communist future in the present proletariat will work as the guarantor of the post-revolutionary communist transition. Whether or not one believes in the inevitability of communism, what we can be sure of is that the options of Leninism or Stalinism, in short the establishment of a kind of communism allied to the bureaucratic state, leads to a world of nightmares. (In view of the contingent and rickety nature of human economic and political history, however, it should be clear that the real starry-eyed dreamers are those who believe present conditions will continue forever, and that change is impossible.) The reason I am spending time on this is that it is my suspicion that the orientation of negative utopianism offers some potential for engaging with this impasse; that the very negativity of ou-topos, i.e., not existing, not even possibly existing, forces a re-engagement with the political structures of the present. But it strikes me this expedition is, in fact, not very utopian in its conception, or that if it is so, it is so only in the weakly propositional sense that reflects any number of dogmas about what a political structure or a state is, or could be. It is perhaps typical of a world in which our political horizons have narrowed so precipitously that the central question that animates so many of the respondents on the website of the project are about ‘starting over again’ and indeed that so many of the initial ‘citizens’ are tourism managers, CEOs, or celebrities. But the political question of creation of a state *ex nihilo* is a naive one, since we know the state as a historical political phenomenon did not come to exist this way, and the question for us is surely more about what the forces and institutions are that prevent *change* to the state as it exists, what interests they seek to entrench and priorities. I am, of course, notoriously grouchy about these projects, but does this not reflect the worst instincts of political philosophers, which is to privilege the notion of political structures as ideal experiments bearing little or no relation to their material reality? Less obscurely, my point is partly that there are obvious political considerations to this project (the ‘cultural olympiad’ as funding source, its brand-conscious presentation, the demography of the team) that are hopefully pressing on your mind – but perhaps more forcefully, the very conditioning of the discussion both by those forces and the propositional model I described above suggests you’re likely to run into some problems. Anyway, I hope these things are on your mind. Rather than fulminate at the project, though, I thought it might be more useful to reflect on the contemporary anarchist response to the Marxian impasse I set out above. This is, I think, important. Briefly, it would be possible to respond to your expedition simply by saying that the apparatus already set up around it serves to condition its reception, especially the ‘become a citizen’ stuff online. A truly radical rethinking of sovereignty, power, people must, to my mind, jettison all beliefs about the necessity of particular trappings of political systems and seek instead their *function*: i.e., where they came from, what they’re used for. But this is as true for thinking about the doctrines of Lenin or failures of Marx to engage the question of the future and what he calls ‘prehistory.’ Brecht/Bloch again: ‘Something is Missing.’ In part, I suspect this is a question about the extension in time of political activity and antagonistic relationships between the working class and power, in whatever form; as has been the case throughout this piece, the question of *time* jangles about us continually. 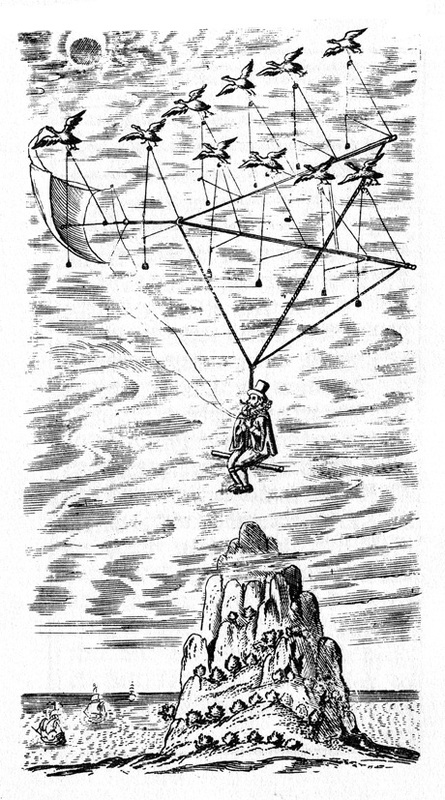 But I do not believe it is possible to answer that question while believing oneself to be thinking in an unconditioned space – this is why the number of questions on the Nowhereisland website about ‘starting over’ or ‘beginning again’ seem to me so dangerous, precisely because it is not possible to think political culture ex nihilo. To my mind, the question of utopia (especially in its guise as negative utopia) weighs very heavily on the political decision-making of the far left, and especially the solution of ‘prefigurative politics’, that model of political practice that influences much of the anarchist and autonomist current in the present day. Graeber taxonomises anarchism as an ‘ethics of revolutionary practice’, and while I like this definition, I do think it has some limitations and problems – above all because holding it up as a solution to the impasse allows us to elide some important political questions, indeed allows many self-styled ‘radicals’ to fall back on solutions that are mere stopgaps or simply intensified forms of the logic of liberalism or reformism. The real question is ‘what does a prefigurative politics prefigure?’ and its appendant issues – I just wanted to pose that question here, especially as it is one I will be writing some explorations of in the next few weeks. Still, it seems to me that prefiguration (even with all its attendant difficulties in execution and, especially, imperfections) is the consequent *next step* from the impulse of negative utopia, and possibly the only one that doesn’t fall into the various traps I’ve outlined here. Is this a return to an idea of ‘utopia from below’? Maybe. I still think it’s too pat, too easy a phrase; tends too much to the model of retreat from confrontation with capital, the desire to organise only in its margins, to live off its cracks and in its lacunae. But what I hope this lengthy note has helped lay out is that the question of utopia is not confined to ‘artists’, nor is it simply a note of consolatory hope, idle and useless in its way, but is for us now at the centre of questions about how we organise, and what we organise for.